Hi everybody- so I’ve been working on a different version of my Escargot going into the high 2018 holiday season. This of course is based on a french classic. 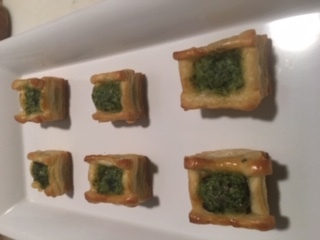 I’ve made miniature/bite size pastry baskets- filled them with an Escargot and then topped them off with my garlic/parsley butter. All you have to do is take them from the freezer (carefully remove the packaging) and put them on a cookie sheet. First cover the cookie sheet with a piece of parchment paper which I provide to prevent sticking and then simply put in a 275f oven for 20 min and serve. (and you know who you are) this version will be a hit. I’ll sell you a few (3,6,9) for that special person. A full box is 2 bags of 15 for a total of 30. Easy and delicious- that’s how we roll at Chef Michaels :)?‍?